Hello! This is my first year being part of SPX. 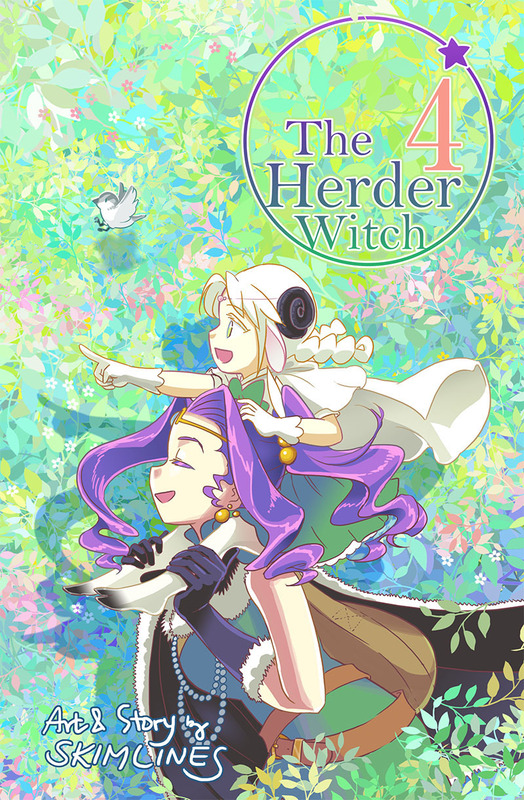 The Herder Witch is a story about a wandering witch named Morie that’s traveling through a foreign land to visit other witches that are scattered throughout the landscape. Accompanying her in her journey is Yanna, a giant sheep that can take human form. With each witch Morie meets during her journey, Yanna learns something new about Morie, and about the history that witches have with the land that Morie wants to hide from Yanna. While many of the witches have much in common and are often eager to bond with each other, not all the witches care to get along with others. The inside pages of this comic book are black and white. The release schedule is one new chapter every other month on Webtoon and Taptastic. There are 5 chapters so far: This is an ongoing series. This story is for teen readers or older that like magical girls. Hello! I’m a Korean American author based out of New York. I was born and raised in Korea until my parents immigrated to the US when I was 13. I utilize storytelling methods commonly found in comics made in Asia for East Asian audiences to create stories with a focus on audiences in the US. I primarily participate in artist alleys at anime conventions in the US to promote my artwork and comic book, since late 2013. The Herder Witch is a magical high-fantasy comic book I’ve been writing and drawing since 2014. I made the first chapter to commemorate the first year I attended New York Comic Con to sell my own artwork. This story draws its inspiration from the experiences I’ve had as an Asian American, an immigrant, a minority; and Korean mythology and Korean kinship systems, but in a fantasy setting. I am bilingual in English and Korean, and conversational in Japanese (JLPT1 certified). I am on Patreon, facebook, twitter, and tumblr. My hobby is playing video games and making pottery. I have two pet mice. I also like to collect 3DS Nintendo streetpasses from around the world (I’m only missing South Dakota in the US) and to read a couple comic books every week. I’m very fond of 90s kpop and period dramas set in Asia. My favorite kind of cake is a toss between Strawberry shortcake and Tiramisu, and I’ve definitely had each of them as my whole dinner a few times.